Thorough training of apprentices and comprehensive upgrade training for member journey workers in world-class education programs give the Painters the advantage when it comes to furnishing our employing contractors with the best finishing-trades workforce available throughout Northwest Indiana. Our local, state-of-the-art training facilities provides cutting edge training programs that are truly second to none. The Training Center provides Health & Safety Classes as well as Journeyperson Upgrade classes to assure that we have the most progressive workforce. We pride ourselves on assuring that our members receive the most advanced training in the country. We are always looking to the future in developing a curriculum that keeps us a step ahead of all the rest. Everywhere you look you can see the work done by painters. Paint serves two important purposes, to beautify surfaces, and to protect surfaces from exposure to weather and corrosive elements. Employment opportunities in this industry range from high-end decorating and wall covering applications to commercial work such as shopping malls, hotels and office buildings as well as industrial jobs on nuclear power plants, refineries and bridges. 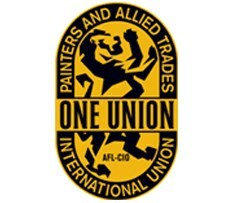 The constant development of new materials, high tech application techniques and increased safety and environmental concerns make the painting trade a challenging and rewarding career. Painters must know how to mix paints and to prepare the surfaces of buildings and other structures and then apply paint, stain, lacquers, varnishes, and other similar materials to theses surfaces. They are able to choose the right paint or finish for the surface to be covered by taking into account durability, ease of handling, method of application and customer desires. However, painting isn't all they do; members of the finishing trades also work with drywall finishing and various wall coverings among other things. Successful Painters need to be in great physical shape to perform the duties of the trade. It is suggested applicants have a fundamental understanding of advanced math and chemistry. The ability to estimate and compute area measurements quickly and accurately is recommended. Written and verbal communication skills are also essential in the trade.